There is a saying: the winners write the history, the losers write the songs. 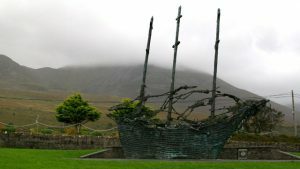 While there is no shortage of Irish songs about British mistreatment of the Irish, it took 170 years for someone to create a whole album of songs the Irish Famine. Declan O’Rourke did that. In the beginning, O’Rourke brought us lakeside to the poor but successful Clogman’s Glen. In Along the Western Seaboard, O’Rourke allowed us to hear a parish priest’s pleas whose parishioners dying words were prayers for relief. He sang of those who sought escape across the seas only to find ocean deaths in the ocean depths. Declan invited us to a wedding the poor boy to the girl with flowers in her hair. We witnessed their love. We stood beside helplessly as an Gorta Mór took all away. We thought he’d written an upbeat tune only to find Declan fed us sandy Indian meal. He introduced us to Mary Kate, a girl those with the means thought they were rescuing. We find the rescue is a forced one and one that forced decisions upon Mary Kate. We in turn are forced us to avert our reddened eyes. We meet a starving father trying to explain to his starving sinless son that they’ve done nothing wrong despite the claims of a laissez faire government policy that dehumanized them and rationalized inaction. The eighth chapter of his album O’Rourke sets us atop a rattling wooden wagon and we hear the bones of a dead pauper sing their story. 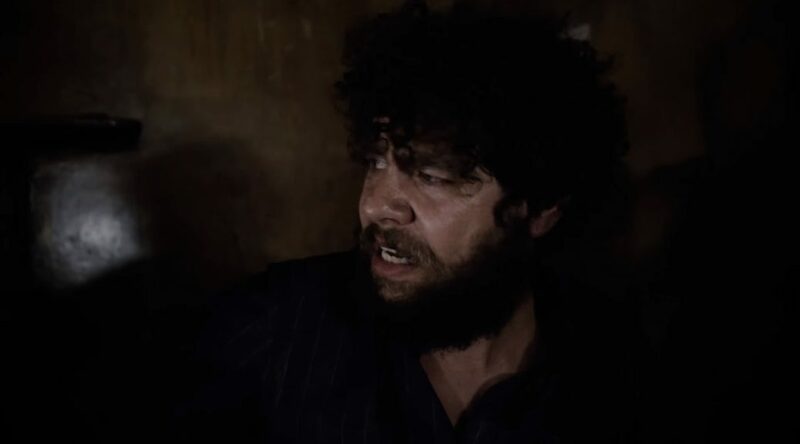 O’Rourke takes us from atop the creaking cart throws us inside the hold of a ship as cargo within a coffin ship, from one open coffin to another. We listen to the true story of the coward Curry Shaw, the child of privilege, the one Fate allowed to live and leave behind frozen corpses. Declan finally fillips a finger (or two) of revenge for us. We waited a long time, but it’s only a momentary draught. An orphan, like the starving father, like Mary Kate, the the poor boy, must attempt a fruitless rescue and faced a thankless offer of aid. Again aboard a ship that does not run into a reef of ice but becomes a mass grave to which survivors and their descendants will one day built a monument to. A monument to remind us that many dead did die in vain. Where do we go from here. How to we bring our journey to an end. Another Irish saying is that the English killed the Irish language, but the Irish stole English in return. In the end, O’Rourke speaks Gaeilge to us. Like many things humans have tried to eradicate and seemingly succeeded, it turns out that the eradication failed. We can learn to forgive. Before the Irish Famine the Irish population numbered approximately 8 million. 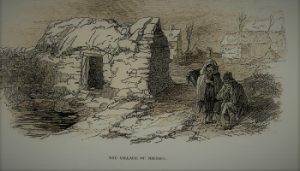 According to a BBC article, “Altogether, about a million people in Ireland are reliably estimated to have died of starvation and epidemic disease between 1846 and 1851, and some two million emigrated in a period of a little more than a decade (1845-55). Two other songs [“Buried Deep” and “Villain Curry Shaw“] on O’Rourke’s Chronicle of the Great Irish Famine album dealt with the fatal horrors even for those who thought they’d escaped the famine by sailing to Canada or the United States or being sent to Australia or New Zealand. Trans-Atlantic travel in wooden sailing ships was never safe no matter the person’s accommodations, but for those who could bring so little and then have a crew pack them into holds with make-shift bunks, meager fare, minimal sanitary facilities, little or no ventilation, and indifference on the part of most crew members, the vessel became a coffin ship. According to a Registered Devil dot com article, “Typically untrustworthy vessels, these ships were purchased literally from salvage yards (where they awaiting dismantling) by unscrupulous owners who had no intention of repairing them. Sailors who agreed to serve on board these floating wrecks typically knew nothing of the dangers until they were well out at sea, vagabonds, and those desperate for work (of which there were plenty) quickly volunteered. 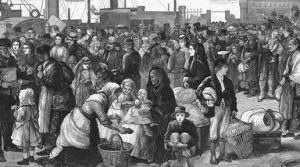 Ships often arrived with disease on board and the United States, purportedly trying to improve passenger conditions aboard cargo ships, but in actuality closing American ports to the Irish, enacted various laws. It must also be pointed out that on January 31, 1848 the United State also enacted legislation that exempted vessels employed by the American Colonization Society in transporting black emigrants from the US to the coast of Africa from the provisions of the acts of the twenty-second February and second of March, eighteen hundred and forty-seven, regulating the carriage of passengers in merchant vessels! Some shipowners and captains evaded these legislative blockades by bringing their human cargo to Canada. Given the inhumane conditions aboard, it was not surprising that ships arrived with diseased passengers. 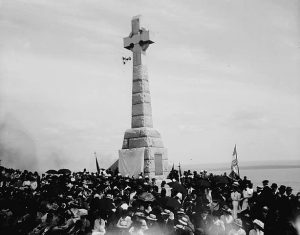 At first, Canadian authorities tried to provide quarantined shelter, but overwhelmed by the number of sick, ships were forced to keep their passengers aboard which worsened conditions. From 1847 to 1848, an estimated 3,000 to 6,000 Irish died while waiting to leave their quarters. In 1909 the Ancient Order of Hibernians in America set up a Celtic cross with inscriptions in Irish, English and French, in memory of those who died during that time. 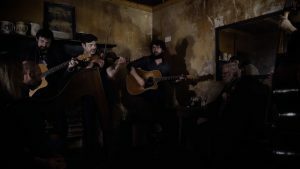 We may have hoped that the retaliatory exhilaration of Johnny Hold the Lantern would end the album on its high note, but O’Rouke returns to the Great Famine’s horror and its helpless young victims. 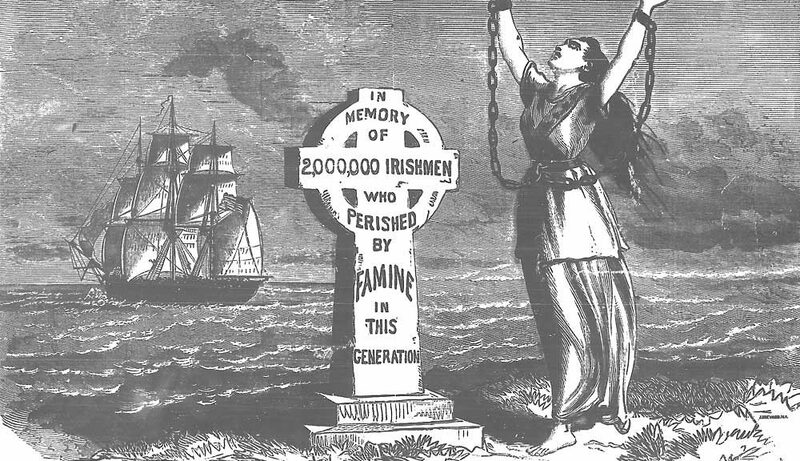 It is no surprise that the Great Famine orphaned so many children. It is also no surprise that even the most insensitive laissair faire proponent would do at least something minimal to relieve their conscience if not the orphans’ suffering. 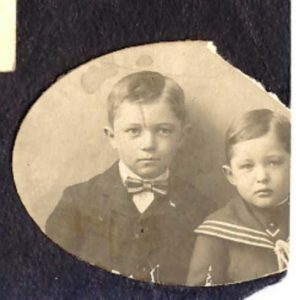 In the Connaught Orphan, we stride beside a barefoot 7-year-old boy walking his younger sister to the poor house ten miles away. Both starving. There is room only for one. He leaves her there and walks the 10 miles back. It is still a common requirement from those who have relief to give that there be a quid pro quo. A demand that the suffering must first be worthy to receive aid. In the case of the Irish peasants, assistance sometimes depended on acknowledging the Church of England as the true church. To renounce Catholicism. In our less religious 21st century world (at least in terms of church attendance), such a demand might seem an easy one to comply with, but the 19th century Church taught it Catholic believers that a choice meant damnation. Quakers were the one religious group that seemed genuinely interested in assistance without strings attached. They formed the Central Relief Committee (CRC) to help coordinate relief. Unfortunately, even the most kindhearted actions can result in unforeseen consequences. In this song, the Quaker wants to provide a bath and clean clothing, but the boy realizes that when his neighbors see him that way they will assume that he has renounced his faith or that he has lied about his neediness. I have a mammy feeds me so. What kind of world had the British government helped foster? One that forced a starving child in rags to refuse food and clothing?